Role playing adventure with non-linear storyline. Is there a better alternative to Eschalon: Book I? Is Eschalon: Book I really the best app in Adventure category? Will Eschalon: Book I work good on macOS 10.13.4? Eschalon: Book I is a classic role-playing game experience that will take you across massive outdoor environments and deep into sprawling dungeons as you seek to uncover the mystery of who - or what - you are. A tile-built, turn-based game world where the result of absolutely every action is rolled, calculated or statistically determined. Strategy is paramount to success; careful skill management, equipment selection and magic usage will win your fights, not rapid button clicking. We are very pleased to say this is not another "action RPG". Version 1.06: Release notes were unavailable when this listing was updated. Mac OS X 10.3.9 or later, 1.8 GHz processor or better, 3D accelerated graphics card. Unlimited character development style: Choose from 24 unique skills to make the character you want and 8 base attributes that affect your character's every action throughout the game. The game world does not scale or adjust itself to match anyone's play style, so the ease or difficulty of the game is directly related to how successful you are at developing your character. Combat plays out at your pace. 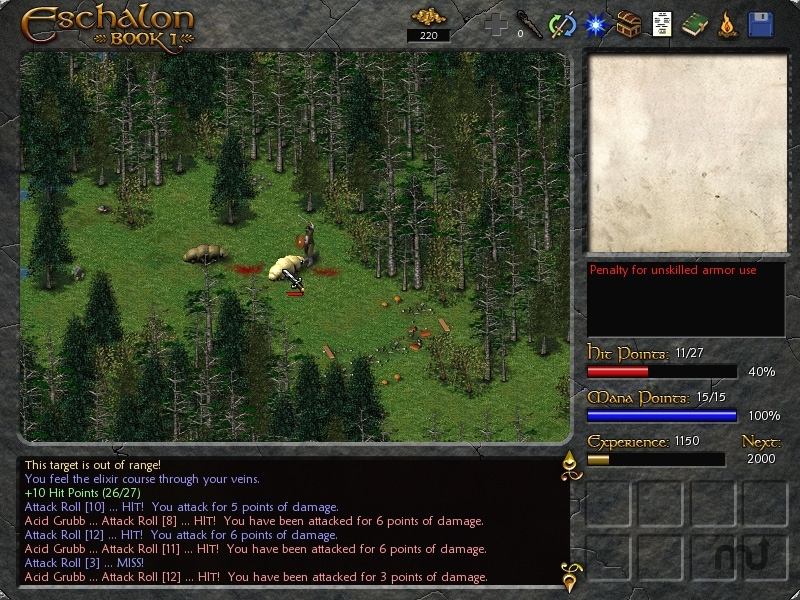 Eschalon: Book I features a turn-based system that allows you to roll through combat as fast or slow you want...make it fast and furious, or analyze every option for maximum advantage. A non-linear storyline means that the game world is open to explore as you desire. Follow the storyline or don't...it's up to you. Just be careful where you go and who you choose to trust- the world of Eschalon can be a deadly place for an inexperienced adventurer. An epic adventure that you must face alone...a single-player RPG carefully designed to feel like the great old school RPGs of the past such as Ultima®, Might & Magic®, and Wizardry®.